As some of you may know, I enjoy painting even if they are not top notch paint schemes. Lately, I’ve found myself painting various different schemes and don’t often use the same paint scheme on multiple units. I’m going to make an exception here as a unified paint scheme for a smallish clan series would be interesting. 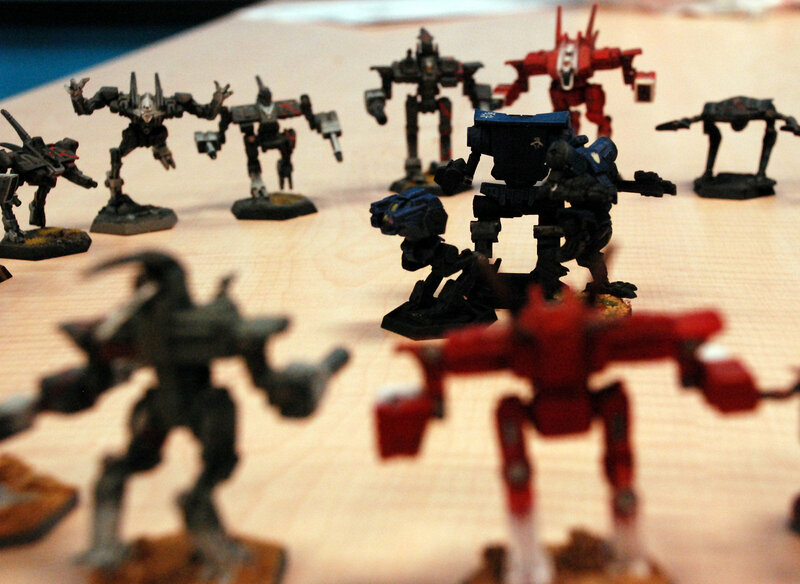 A few years ago, the local battletech group started doing a painting version of Secret Santa. The second year we did one, I pulled the Lord of Reaving himself. I opted to do a society mech and chose the Septicemia in the ATM/heavy laser configuration. I ended up painting it in Clan Coyote Zeta Galaxy colors. Since my freehand isn’t the best, I painted two of them so he could choose which one he liked. The symbols were mostly the same. That was the first time I had tinkered with alternate configurations for clan omnis. When Savage Coyote brought up this project, I decided I wanted to do some things that I hadn’t done before. My first goal was to do a clan nova. The second was to make a cohesive force that the minis actually match the configurations. This will prove interesting. The third was to keep adding some Society mechs. I started to work something up in Coyote Zeta colors around that Septicemia A (AZ actually). Looking around, I also had a Cephalus D and an Osteon D that I could paint. I sat down to see what kind of star I could put together. I was going to go with a Striker star but the Osteon is a deal breaker. The Battle Star would be an option but I’d have to carefully select some units. Switching from the mechs, I started looking at my options for battle armor. For a nova, the infantry do not count against the requirements for the lance or star. Going to the MUL and then looking up my options for Clan Coyote in the Jihad era, I discovered my first major hurdle. The most expensive infantry I could work with was 18 points each. That is only 90 points of the 360 to 400 points allotment. That isn’t good. But we will charge ahead and see what we can do. At this point in time, we are looking at 240 points. I need two very expensive mechs to make this work. I spied the Timberwolf Z at 60 points. After looking up the stats and the fact that it was a Skirmisher that I need for a Battle Star, I added that to the list. I also checked to make sure it was going to be something I could build. It is, so on the list it goes. The last unit needs to be in the same ballpark for points and it needs to be a at least size 3 and a brawler, sniper, or skirmisher. At this point in time, I have one of each of the sizes (1, 2, 3, and 4). I also have a Striker (no help towards the requirements), a Brawler (required unit), Skirmisher (required unit), and a Juggernaut (no help). The last unit will need to be expensive and from one of my needed roles and also a size 3 or 4. Clan Coyote isn’t known for fielding a ton of Executioners but the ATM version caught my eye. Unfortunately I needed the points and instead went with an Executioner D instead. Looking them up and I see I can build them all. So that was the original army. And it was soundly set aside to be rebuilt into something different. Why? While it was slightly below the point value, it was the NOVA and damage profiles that made me decide to drop it. In Alpha Strike, you can’t shift the NOVA around like you can under traditional battletech. I essentially had to pair two mechs together and hope for the best. I had some mechs that were monsters in short range and paid a pretty price for that damage. I just didn’t have the longer ranged firepower that I thought I would need to be able to survive on the charge in. Thus Clan Coyote Zeta exited stage left for a Clan Coyote Epsilon from stage right. This will be where we pick up next time.